Commerce City, CO began as undeveloped agricultural land. It wasn’t until 2002 when Shae Homes finally developed the land. It is now an annexed area of Commerce City located inside Adams County. Reunion is only ten miles from the Denver International Airport and just about 20 miles from downtown Denver. Reunion has over 150 acres of parks and 170 acres of open space. The parks include athletic fields, playgrounds, lakes and miles of trails to enjoy. The Buffalo Run Golf Course is also a local favorite offering residents a number of spectacular facilities such as a top-of-the-line clubhouse, a versatile practice facility, restaurant and pro-shop. 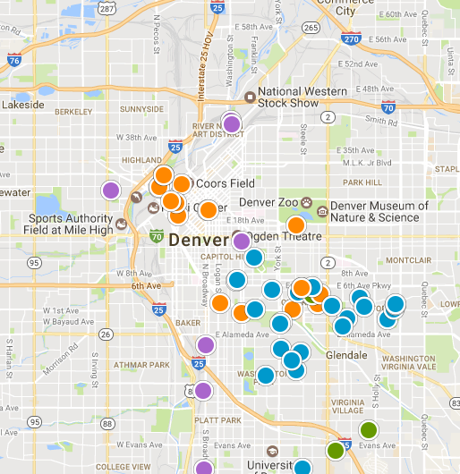 Being close to downtown Denver lets those in Reunion experience all of the amenities that a big city would offer. Reunion is served by the 27J School District and has three elementary schools and two middle schools in the area. Prairie View High School and Brighton High School are the two options for Reunion students to attend. The median listing price for homes in Reunion are around $440,000 which has been at a slight increase for the past three years.